Invasives II is a year-long documentation of specific invasive plant species in several places near my home in Connecticut. Most people are familiar with the Kudzu-covered landscapes of the Deep South, which were beautifully documented by the artist William Christianberry. Kudzu is now in southern New England, fighting for territory with other vines, most notably Japanese Porcelainberry, Mile-A-Minute (Persicaria perfolioata), and Oriental Bittersweet. These vines transform the familiar landscape. Like many of its well-dressed human neighbors, the "Invaded Spruce" on my local Audubon Society property wears a new look each season. Last summer, the property's maintenance committee cut down several trees obliterated by vines, but left the Invaded Spruce alone, even cutting the grass around it late in the season. While old trees and fences provide scaffolds for invasive vines, some of the most invasive species don't care where they call home. 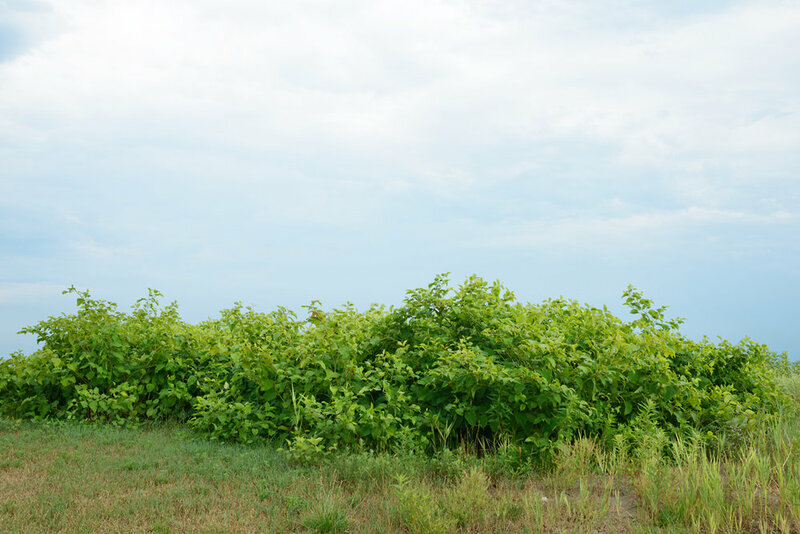 Japanese Knotweed is so invasive that it is outlawed in many states and the continent of Australia. It is nearly impossible to eradicate. The knotweed stand on my local beach was burned to the ground with chemicals in early August. Three weeks later, it grew back.